. 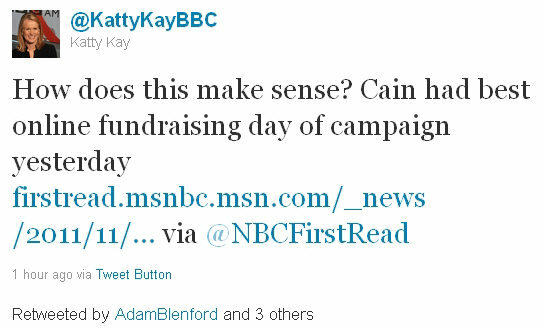 @KattyKayBBC @AdamBlenford if someone at BBC America was listening to Talk Radio y’day you’d know how. Life beyond the BBC Beltway Bubble. They really don’t get it, do they ? The fact that this news came as such a surprise to the BBC’s US anchor and its online Washington editor is quite incredible. It probably makes sense to anyone who inhabits the real world, you stupid cow! Is it just me or has today been one long, egregious stream of shite from the BBC? I mean, even more than normal? Katty Kay living in a media bubble where everyone around her agrees with everyone else, and that bubble is inside a bigger bubble which is the “Re-elect Obama Bubble”. The BBC lives inside a “Metropolitan Left-Wing Pricks” bubble. @KattyKayBBC After polls on protests and tea party…RT #POLITICO Dems take direct aim at tea party http://politi.co/umdcrsCall this news reporting, or active spreading of “propaganda”? Good job she’s impartial. How sweet to have identical twins on this website ! Maybe she is asking the question rhetorically? “They really don’t get it, do they?” Grant asks. Well, actually they do get it, Grant. But they are who they are. And who are they? Well, here’s a quote from the esteemed DB a few months ago right here on B-BBC. The informal links between the left in all countries are deep and self-serving. How can we expect fair play from people like these? In fairness, it strikes me that even outside of politics quite a few things pass Katty Kay by. She may be a clever lady but she is not a “reporter”. She finds only what she looks for. No amount of cleverness hides that. 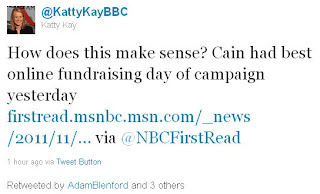 Those Carney – Kay links are totally unacceptable. How can she do her job in the face of “pillow talk”? If the Secretary of Defence was married to a KGB Agent, how could the nation’s security not be undermined? The BBC continue to be our National Disgrace. Herman Cain must be the Democrat’s nightmare. I’m betting the harassment allegations (no opininion about their veracity) originate from Democratic Party HQ. The BBC will know about this only if someone else does some investigative reporting.